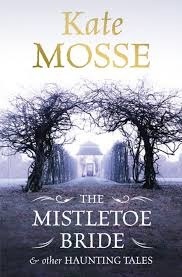 Having enjoyed the novels Labyrinth, Sepulchre and Citadel by internationally Best Selling Author Kate Mosse, I would like to read The Mistletoe Bride and Other Haunting Tales, which has recently been published in paperback. The book has been described as A wonderfully atmospheric collection of short stories from a captivating writer, inspired by ghost stories, traditional folk tales and country legends from England and France. The tales are richly populated by spirits and ghosts seeking revenge; by grief-stricken women and haunted men coming to terms with their destiny – all rooted deep in the elemental landscapes of Sussex, Brittany and the Languedoc. The collection includes The Mistletoe Bride, La Fille de Melisande, Red Letter Day, The Lending Library and The House on the Hill. “The Yellow Scarf, takes place in an ancient Oxfordshire estate in the mid-1970s, where Sophia is accompanying her aunt on a coach tour of minor stately homes on A week’s holiday from work, all expenses paid, and although Sophia is enjoying herself she finds constant company a little tiring so she seizes the opportunity to explore on her own. Intrigued by the selfsame folklore Mosse explores in the starter story “of a young bride said to have disappeared here on her wedding night”—Sophia ventures into a small family chapel wherein she spots “a piece of historic graffiti” relating to the long-dead newlywed and finds herself transported back in time where she meets a young woman and unwittingly finds herself embroiled in the tragic events of Minster Lovell Hall discovering that there is much more to the old story than she realised. Kate’s new novel, The Taxidermist’s Daughter, will be published in autumn 2014. Kate is also the Co-Founder and Chair of the Board of the Baileys Women’s Prize for Fiction (previously the Orange Prize) and was also awarded an OBE in the Queen’s Birthday Honours List for services to literature. Wombat Day is an unofficial holiday introduced in 2005 and held on 22 October to raise awareness of these endangered short-legged, muscular quadrupedal marsupials which are native to Australia. Wombats are approximately 1 metre (40 in) in length, with short, stubby tails. All are members of the family Vombatidae and they are adaptable in habitat tolerance, and are found in forested, mountainous, and heathland areas of south-eastern Australia, including Tasmania, as well as an isolated patch of about 300 hectares (740 acres) in Epping Forest National Park in central Queensland.Wombats are herbivores; their diets consist mostly of grasses, sedges, herbs, bark, and roots. Their incisor teeth somewhat resemble those of the placental rodents (rats, mice, etc. ), being adapted for gnawing tough vegetation. Like many other herbivorous mammals, they have a large diastema between their incisors and the cheek teeth, which are relatively simple. Wombats’ fur can vary from a sandy colour to brown, or from grey to black. All three known extant species average around a metre in length and weigh between 20 and 35 kg (44 and 77 lb). Wombats dig extensive burrow systems with their rodent-like front teeth and powerful claws. One distinctive adaptation of wombats is their backwards pouch. The advantage of a backwards-facing pouch is that when digging, the wombat does not gather soil in its pouch over its young. Although mainly crepuscular and nocturnal, wombats also venture out to feed on cool or overcast days. They are not commonly seen, but leave ample evidence of their passage, treating fences as minor inconveniences to be gone through or under, and leaving distinctive cubic faeces. Female wombats give birth to a single young in the spring, after a gestation period, which like all marsupials can vary, in the case of the wombat: 20–21 days.They have well-developed pouches, which the young leave after about six to seven months. Wombats are weaned after 15 months, and are sexually mature at 18 months. Wombats have an extraordinarily slow metabolism, taking around eight to 14 days to complete digestion, which aids their survival in arid conditions. They generally move slowly. When threatened, however, they can reach up to 40 km/h (25 mph) and maintain that speed for up to 90 seconds. Wombats defend home territories centred on their burrows, and they react aggressively to intruders. The common wombat occupies a range of up to 23 ha (57 acres), while the hairy-nosed species have much smaller ranges, of no more than 4 ha (10 acres). Dingos and Tasmanian devils prey on wombats. Extinct predators were likely to have included Thylacoleo and possibly the thylacine. Their primary defence is their toughened rear hide, with most of the posterior made of cartilage. This, combined with its lack of a meaningful tail, makes it difficult for any predator that follows the wombat into its tunnel to bite and injure its target. When attacked, wombats dive into a nearby tunnel, using their rumps to block a pursuing attacker. A wombat may allow an intruder to force its head over the wombat’s back, and then use its powerful legs to crush the skull of the predator against the roof of the tunnel, or drive it off with two-legged kicks, like those of a donkey.In general, Australian culture does not regard the wombat highly and it certainly has nothing like the cultural significance of other native animals such as the koala, kangaroo or the dingo. All species of wombat are protected in every state except for Victoria. The northern hairy-nosed wombat is an endangered species. The biggest threats the species faces are its small population size, predation by wild dogs, competition for food because of overgrazing by cattle and sheep, and disease. The only known wild populations of this species exist in two locations in Queensland, the Epping Forest National Park, and a smaller colony being established by translocating wombats to the Richard Underwood Nature Refuge at Yarran Downs. This second colony is being created through the Xstrata reintroduction project, which is being funded by Xstrata, a Swiss global mining company. The wombat population in the Epping Forest National Park has been increasing since a predator-proof fence was erected in the park. According to the latest census, taken in 2007, the park is home to 138 of these endangered wombats. Despite its name, the common wombat is no longer common, and it has been officially a protected animal in New South Wales since 1970. However in Victoria they are not protected as they are considered by the Department of Environment and Primary Industries to be a pest and are also seen by many as being fat, slow, lazy animals, and are often mocked. Particularly common wombats are considered by some farmers as a nuisance due primarily to their burrowing behaviour. Wombat meat also used to be a source of bush food from the arrival of aboriginal Australians to the arrival of Europeans, but is no longer eaten due to the officially Protected Status of the Species. The Montparnasse derailment occurred on 22 October 1895 after theGranville–Paris Express overran the buffer stop at its Gare Montparnasse terminus. With the train several minutes late and the driver trying to make up for lost time, it entered the station too fast and the train air brake failed. After running through the buffer stop, the train crossed the station concourse and crashed through the station wall before falling 10 metres (33 feet) onto the Place de Rennes below, where it stood on its nose. A woman in the street below was killed by falling masonry. The driver was fined 50 francs and one of the guards 25 francs.The train was outside the station in this position for several days and a number of photographs were taken. At least one photograph is out of copyright and is used as the cover page of a book by John Taylor and on the front cover of Mr. Big’s album, Lean into It.